Tamaroa Community High School "Indians"
Tamaroa (population 740) is located in southern Illinois in northwest Perry County. U.S. Route 51 runs through the center of town and connects it to its larger neighbor seven miles to the south, Du Quoin. The Illinois Central Gulf Railroad joins with the Missourri Pacific Railroad south of town and splits again just north of Tamaroa. A branch of the Collier Creek flows through the north end of Tamaroa. The town name comes from the historic Native American tribe of the same name, The Tamaroa. The Tamaroa Indians were a part of the once proud and strong Illiniwek Indian Confederation in Illinois. Tamaroa residents probably began education efforts for their children in the late 1800s. 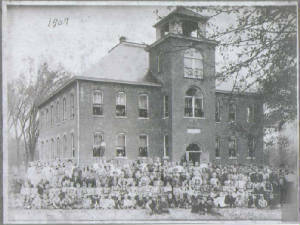 For several decades the town supported its own high school and grade school district. The school building at the top of this page served as both high school and grade school until the early 1950s. 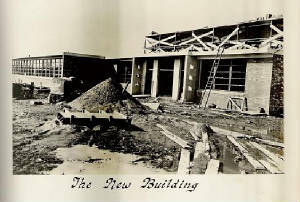 A new high school building was then contructed "on the west edge of town". At some point, probably in the late 1980s or early 1990s, serious talks were initiated about the closing of the high school. These talks became a reality and the Tamaroa High School District was closed. The Class of 1988 was the final one to graduate from Tamaroa High. Brent Beltz, a member of this class, tells us that in the fall of 1989 the high school aged kids of Tamaroa began attend school in nearby Pinckneyville. This arrangement continues today. Tamaroa still proudly supports its own grade school for grades K - 8. 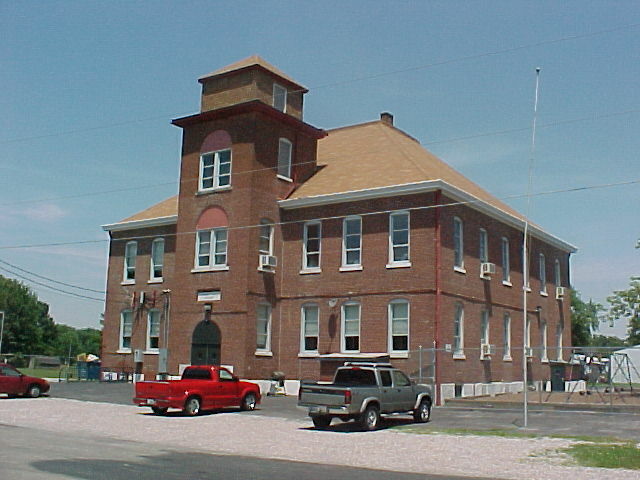 The original Tamaroa Grade School building is pictured above and below. A great fan of the site, Ella Wilson (a former grade and high school graduate of the school system), advises that the building pictured above... "served as both grade school and high school until the new high school "west of town" was completed." . Tamaroa High School definately offered boys basketball and girls volleyball, these sports are mentioned on the IHSA web site (www.ihsa.org). It is thought that Tamaroa High School probably also offered track for boys and girls as well as baseball for boys and softball and basketball for the girls. This information for some of the greater accomplishments by the student athletes of Tamaroa's rich history is in need of research. We hope a fan of the site from the Tamaroa area can assist us. "I wanted to mention that from 1984-1988, the boys sports programs (at Tamaroa HS) were baseball and basketball. During those years for the girls, they had cheerleading, basketball and volleyball." The boys basketball team of Tamaroa High won three titles in IHSA District tournaments. Two of them were back to back in 1969 and 1970. 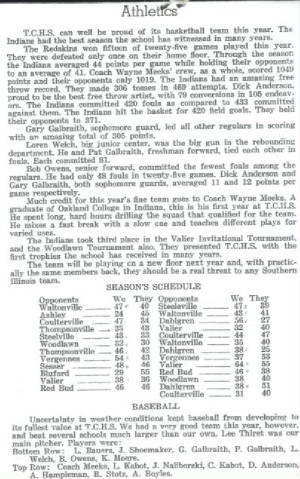 With such a long history we're confident there were many great teams that perhaps did not win IHSA hardware but may have been conference champs or 20-game winners. If you have information or photos of any of the great Tamaroa High School teams please write us at eganann@sbcglobal.net . The years of the District title teams are listed below. Unfortunately the team records and coach's names are not available. Three seasons of girls volleyball at Tamaroa High School are listed on the IHSA web site. The best of those three is also the last listed which is of the 1987-88 season. The seasons and coaches names from the IHSA web site are listed below.